What’s New – Floating Space Theatre Co.
Intended as a multi-layered dialogue with the online space, its consciousness and evolving practice, Floating Space Theatre Co. presents its latest work ‘rite | now’ – a site-responsive sound installation. ‘rite | now’ is designed as a durational immersive experience that evolves over a two-day period. The work is open to the public free of charge this weekend on December 2 and 3 from 11am-6pm at Trace Expert City, Maradana, and is presented in conjunction with the Global Voices Summit 2017 in Sri Lanka. How fragile is the digital space? How fragile are we as we engage in the contexts and methodologies of digital practice? How does the archive of knowledge transform because of the digital conversation? How does the way we know, the way we experience, the way we engage shift or change because of the new ways of speaking we encounter – and are invited to experiment with? The spaces we occupy online give us frames of knowing and understanding ourselves in relation to site and content. And yet, there is fragility: fragility that we contend with, even as we participate within the structures of content-generation and knowledge-proliferation. Even as we contend with our changing senses of our ‘right’ and dis/empowerment in this new phase/face of being human. How will we shape our own ‘trace’ – these fragmentary acts of participation that we intend to be witnessed? From this evolved the form of a site-responsive sound installation: we responded to the openness of physical site of the venue, juxtaposing the sensations of a meditative experience with the Global Voices Summit intention to “rewire societies for resilience, reflection and deep research”. We also responded to site in terms of the content of the work, looking into our own responses to the age of the digital and our inhabitation of the online space, while engaging with the Global Voices discourse and community. We chose sound as the expression of the performance work, so that the work speaks as an act of digital art practice. We chose the frame of an installation that would enable participation, and engagement with the work as always in process. ‘rite | now’ is a solitary experience, as well as a performance that evolves through the act of participation. Over the real-time lifespan of this durational work, ‘rite | now’ will grow through the engagement and contributions to it that take place in the moment of encounter. These encounters, it is hoped, will affect the installation – as it is commented on, and disrupted. The invitation to participate then is not simply in the experience of hearing/listening. It is also extended in the desire to elicit a response that will stand as acts of expression and witness. It is also extended in the awareness that to participate is always only a choice. We wanted to hold on to the premise are still scribes unknown, only emerging in a conscious articulation of who we are online, how we know, and what traces of ourselves we must contend with, before we are ready to accept their own aliveness. 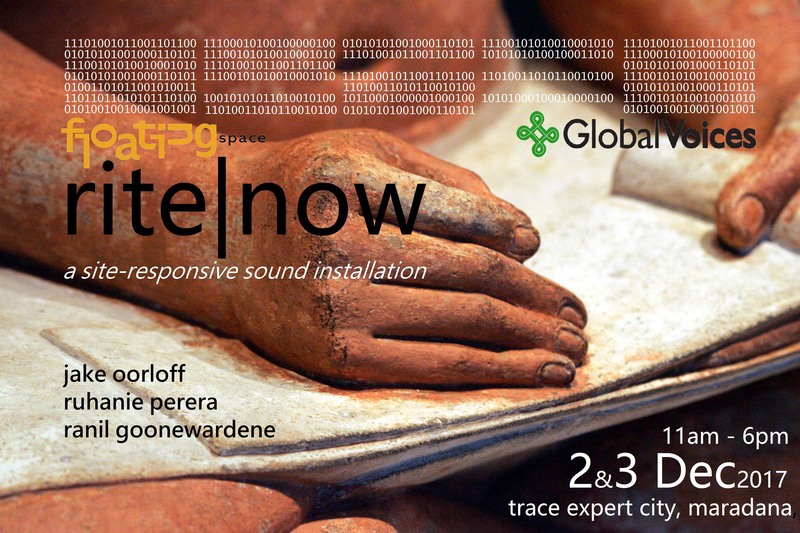 ‘rite | now’ is conceived by Jake Oorloff and Ruhanie Perera in collaboration with sound artist Ranil Goonewardene. ‘Practice – as Politic: A Sharing of Research Insights from the Performance Archive of Floating Space Theatre Co.,’ a lecture-performance presented by our creative directors Jake Oorloff and Ruhanie Perera, is a reflection on the socio-cultural dynamics of place, context and narrative that locates the performance work of the company. Drawing on performance moments, language and aesthetic, and working principles, the intention for this sharing is to trace a trajectory of confronting the theatre as concept, making and site. Ruhanie Perera and Jake Oorloff are in residence as visiting scholars with the South Asia Program, Cornell University. This seminar will bring to a close their period of research and critical reflection, and conclude the first stage of their research project titled Archiving Practice: Reflecting on Floating Space Theatre Company’s Performance-Making Approaches and Politics in the Context of the Conflict and Cultural Landscape of Sri Lanka. For more information on the event and for the full list of seminars click here. 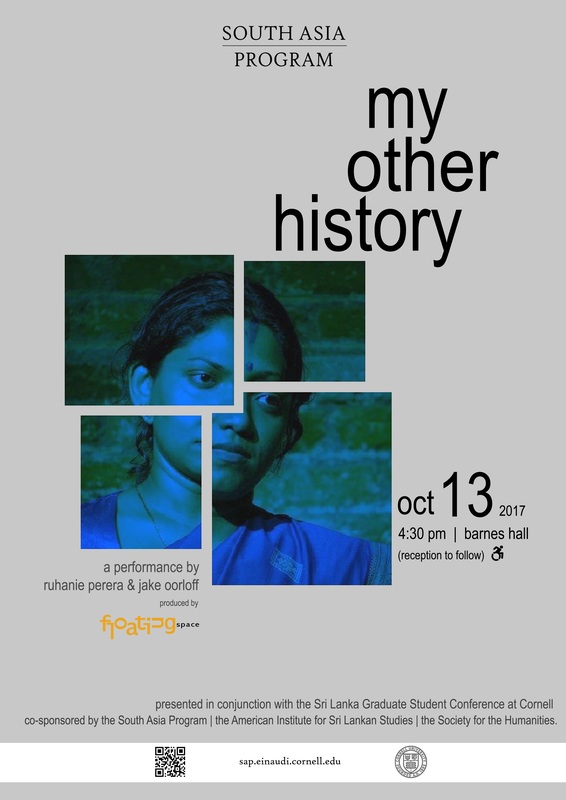 Floating Space Theatre Co. is pleased to be presenting ‘My Other History’ on Friday October 13 at Barnes Hall Auditorium, Cornell University. The perfoance opens a weekend of critical conversations under the theme “Sri Lanka: Critical Reflections on Legacies of Authority and Difference” held as a part of the Sri Lanka Graduate Student Conference at Cornell University. The event is co-sponsored by the South Asia Program, the American Institute for Sri Lankan Studies and the Society for Humanities. Awarded the Sunethra Bandaranaike Trust Grant in 2011, ‘My Other History’ was written by Jake Oorloff and presented as part of (Un)making Time – a project to support new theatre-making initiated by the Sunethra Bandaranaike Trust. The performance has toured three other cities Galle, Jaffna and Kandy between the years 2011 and 2012. Reconciliation was the theme suggested by the Trust, and the performance focuses on a history and experience of displacement and dislocation as a result of war in Sri Lanka. The inspiration for the script was found in a short text titled ‘Home Town Jaffna’ written by D. Subramaniam, who was forced out of his home due to the conflict in the area of Jaffna were he lived. The plot follows his travel to Colombo and eventual return to his place of origin. Set in a time of Sri Lanka’s move toward political reconciliation, ‘My Other History’ explores the idea of reconciliation as a moment of remembrance, a process of letting go, an act of listening as much as that of confrontation. While emphasis is placed on a reconciliation that is political and collective and pivots sometimes on a notion of moving forward that does not acknowledge its past, this is the story of the personal. ‘My Other History’ is set in the present, while referring to a past that plays out through the memory of a young man and his conversation with his mother who tries to connect her son to his past, and to what is her history. It hints at the history of a people denied of land, memory and life; it touches on a family’s sense of belonging in the context of their experience of displacement and their understandings of being patriotic or even their ability to love their country. At the ten-year juncture of Floating Space Theatre Co., its founding members Ruhanie Perera and Jake Oorloff are in residence as South Asia Studies Fellows with Cornell’s South Asia Program. This period of research and critical reflection titled Archiving Practice: Reflecting on Floating Space Theatre Company’s Performance-Making Approaches and Politics in the Context of the Conflict and Cultural Landscape of Sri Lanka provides an opportunity for the company’s founding members to critically reflect on the practice of Floating Space. The company has always believed in a reflexive practice, and this is a crucial step in this direction enabling within an academic environment a review of artistic and scholarly contributions made by the company over the last decade. This residency period is also supported by the Sunethra Bandaranaike Trust in Sri Lanka. 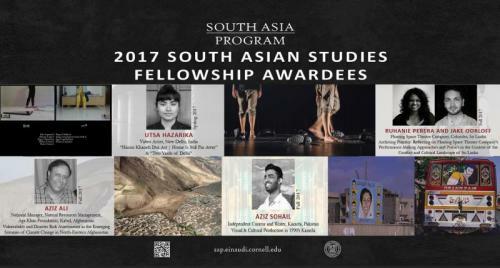 We are pleased to announce that Floating Space Theatre Company’s artistic directors Jake Oorloff and Ruhanie Perera have been awarded Cornell University’s Inaugural South Asia Studies fellowship 2017-2018. At the ten-year juncture of the company, its founding members will travel to the United States to take up positions as visiting scholars and engage in research for a period of two months. 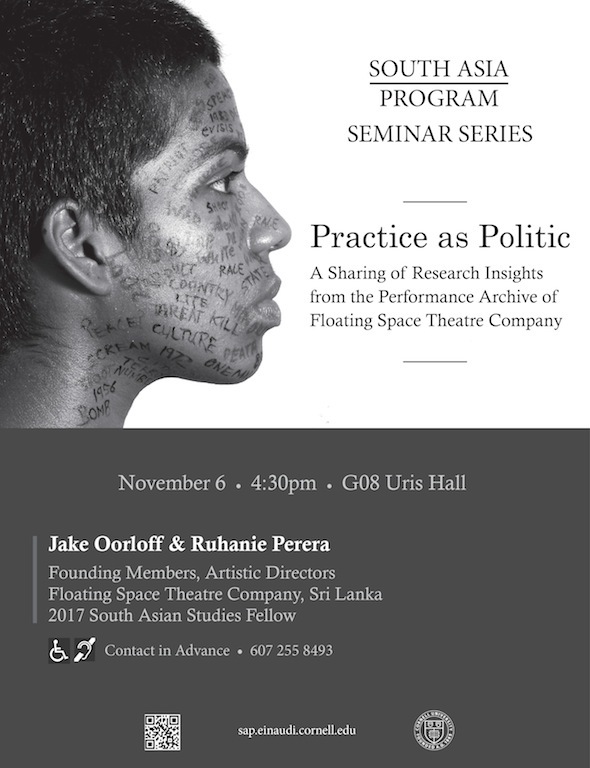 This research period titled Archiving Practice: Reflecting on Floating Space Theatre Company’s Performance-Making Approaches and Politics in the Context of the Conflict and Cultural Landscape of Sri Lanka provides an opportunity for the company’s founding members to critically reflect on the practice of Floating Space. The company has always believed in a reflexive practice, and this is a crucial step in this direction enabling within an academic environment a review of artistic and scholarly contributions made by the company over the last decade.